The fire destroyed the family home in Mallow, Cork, on Tuesday. 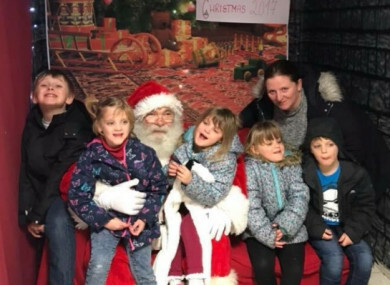 Mary Gore and her children meeting Santa this year. A YOUNG FAMILY who was coming to terms with the death of their father last month have lost everything they own in a house fire in Mallow this week. Mary Gore and her five children had been trying to adjust to the death of dad Chris when their home went up in flames on Tuesday. Now, as a result of a GoFundMe page, over €9,000 has been donated to help the family rebuild their home. People have responded in their droves since a family friend of the Gores told the family’s story on the Neil Prendeville Show on Cork’s RedFM. A number of Cork businesses have also chipped in. Casey’s Furniture will give her new beds. The New Furniture Centre in Blackpool are giving her a new sofa and there has been a number of offers of clothes, toys, Christmas trees and other items the families will need ahead of the festive period. The council said it will also provide them with a three bedroom house so that they have somewhere to stay this Christmas time. Family friend of the Gores, Carol Guerin, said the family left for school one morning and received a phone call that her house was on fire. “The kitchen is destroyed, the ceiling is gone, literally everything in the house. They literally have the clothes on their backs. Toys for Christmas were also destroyed in the fire. “The kids have had a very rough time. They’ve lost everything. Mary is in shock. She’s still trying to get over the grief of losing Chris and she had just started coming out and doing a few bits and focussing on a happy time and then the house going just set her back. Email “'Everything is gone': Family loses everything in house fire just a month after father died from cancer”. Feedback on “'Everything is gone': Family loses everything in house fire just a month after father died from cancer”.